My favorite thing about the three months Nicole and I spent living in New York's Catskills before our recent move to Hoboken? 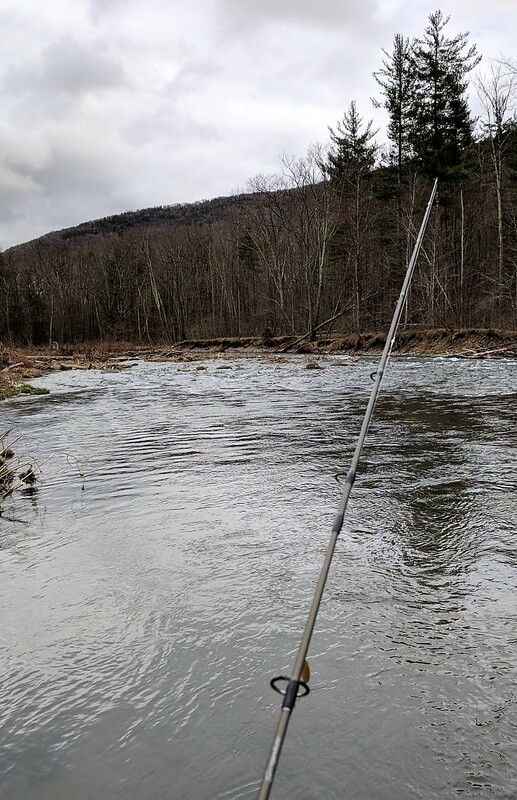 Hunting trout on the Esopus Creek. 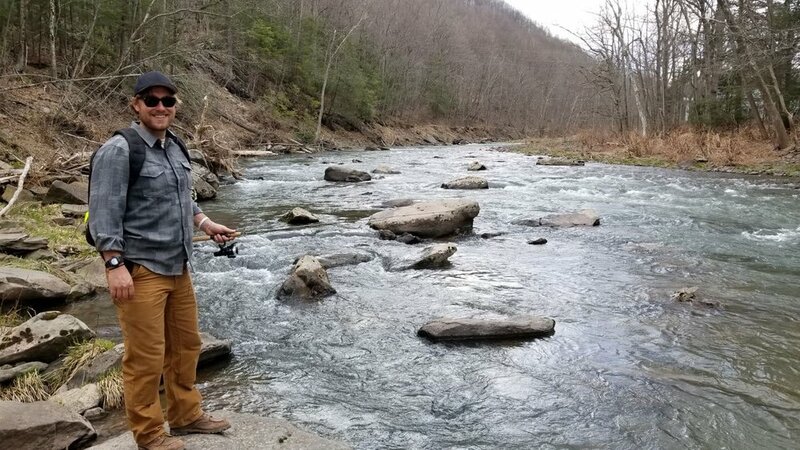 Not since high school had I spent time trout fishing. So I knew some of the basics, but fishing in shallow, fast moving water challenged me anew. I spent a lot of time studying up, exploring, casting, retrieving, and ultimately landing some fish. 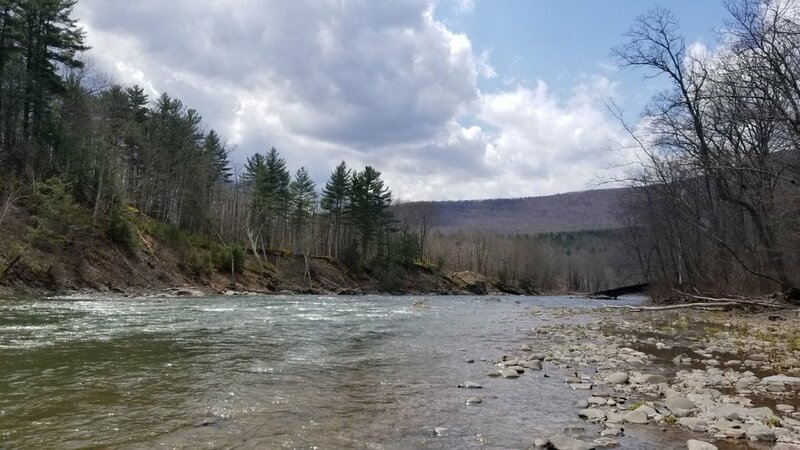 What follows is a quick guide I put together for other relatively new anglers looking to make a trip to the Catskills. Unquestionably, fly fishing is the purist form in the area. 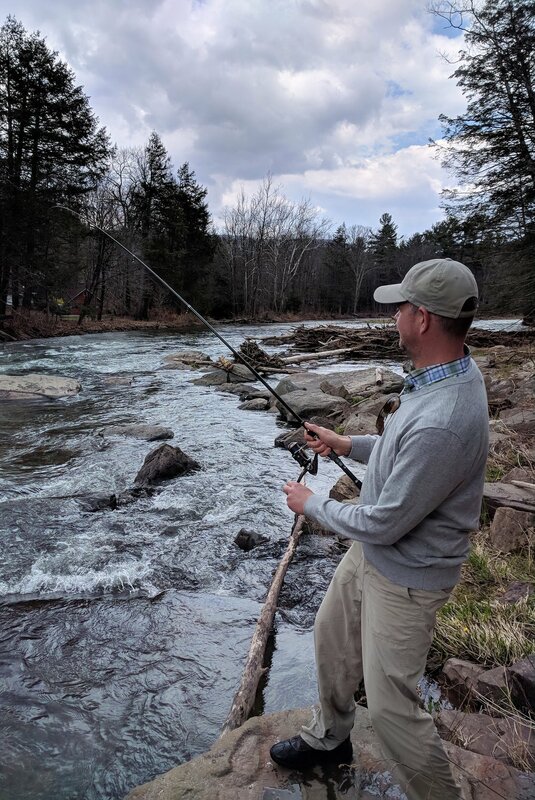 A newbie like myself, with a spinning real casting from the banks, sometimes feels like a simpleton compared to the Orvis clad fly fisherpersons whipping their lines while waste deep in the water. But there are lots of other newbies bank fishing the Esopus and, who knows, maybe one day I will graduate to become one of the River Runs Through It lookalikes. For now, I get plenty of kicks and enjoyment from my simpler setup. 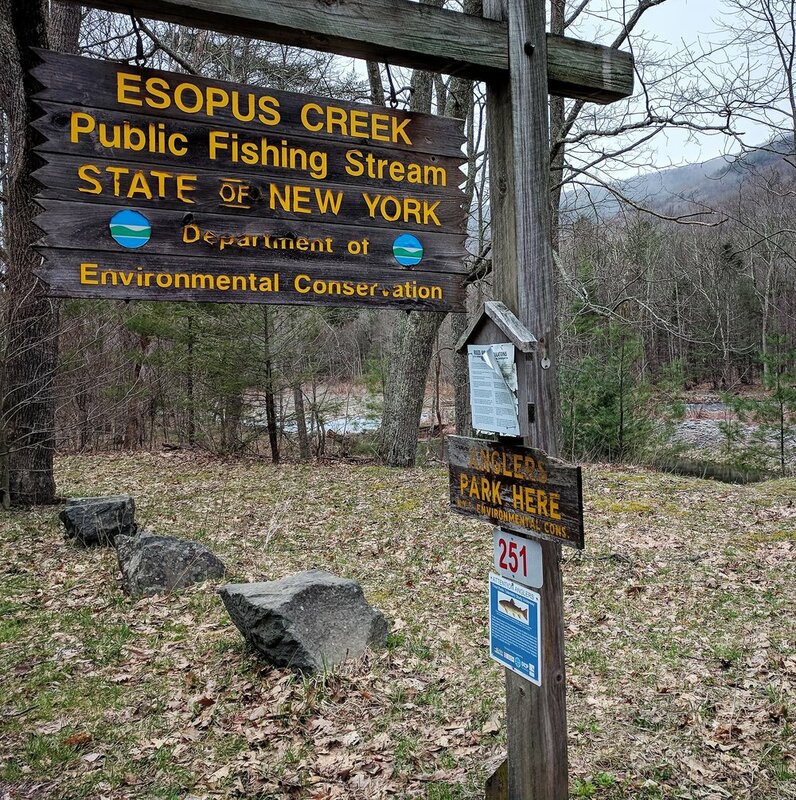 The Esopus Creek originates at Winnisook Lake, in the Slide Mountain Wilderness Area of East-Central New York, then flows 65 miles east before emptying into the Hudson River. For fishing purposes, I only concerned myself with the 26 mile "upper" section between Winnisook Lake and the Ashoken Resovoir. That "upper" section is known in the Northeast as a trout creek. Finicky, wild Rainbows lurk below the surface along with the 20,000 Brown Trout stocked by the State each year. 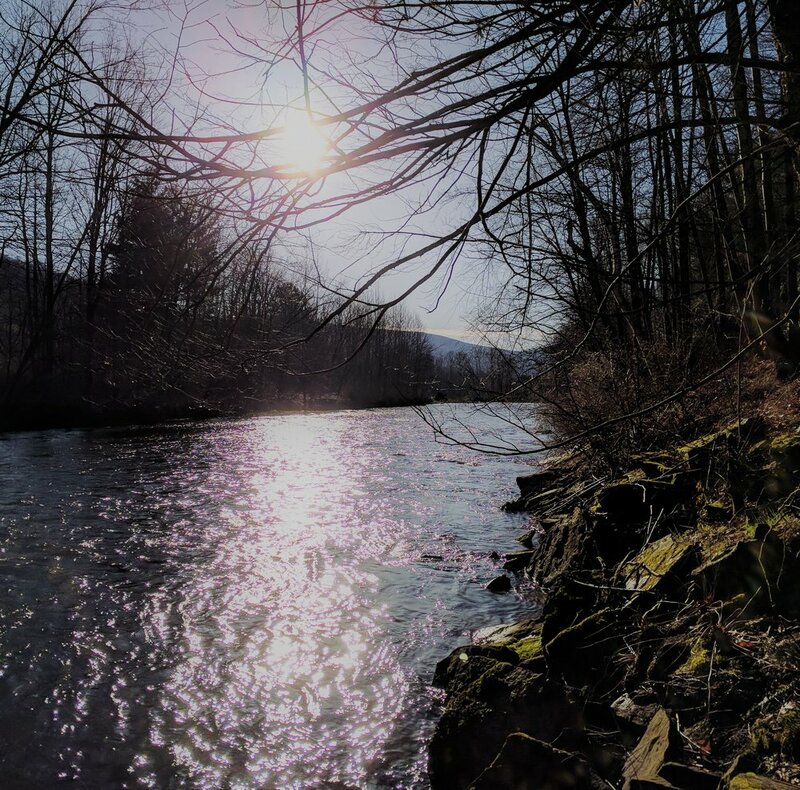 The Creek's popularity with anglers is readily apparent as you drive along Highway 28 which parallels much of the upper section. No shortage of fisherpersons will be wading the waters during the Spring through Autumn fishing season. For a newbie, don't let that scare you away. I've spent a lot of time with a line in the water and never felt so crowded as to severely limit my options. The nice thing about river fishing is that, if one hole is crowded, there's usually another equally good fishable spot close by. I'm not telling! My spots are my spots! But truthfully, with some patience, it's not hard to find good fishing places on the Esopus. The upper section is not long and conveniently parallels Highway 28 making access relatively straight forward. To discover your own fishing holes there are two primary resources, the New York State Department of Environmental Conservation's (NYDEC) public fishing rights map and Google Maps, which depicts NYDEC land in green. Using these two resources, it's (mostly) easy to identify the three classifications of publicly fishable waters: (1) Public Fishing Rights land, which are easements purchased by the NYDEC for the benefit of the fishing public, (2) NYDEC land, and (3) New York City Department of Environmental Protection (NYCDEP) land, which requires a free, special permit (explained below). From there, it's really about driving around and checking out different potential fishing holes. 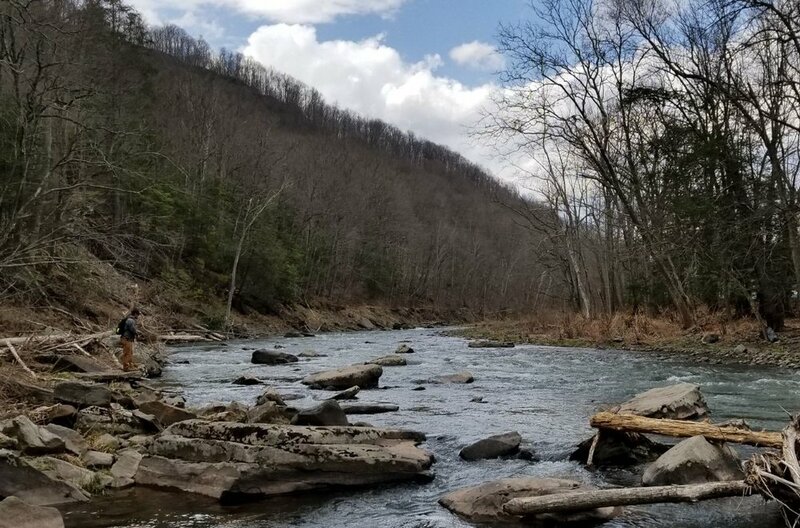 There are many small, unpaved parking areas off of Highway 28 near the fishable areas of the Esopus, but plan on hiking around a bit too if you really want to find prime locations. For that reason, and the prevalence of ticks, it makes sense to wear long pants and shirt. Also, it really, really improves the experience to have an automobile. I once fished the Esopus using a bicycle from Graham & Co. as transportation. I had fun, but didn't catch anything, and found I couldn't really get to a wide enough swath of the Creek. Having a car is the way to go for out of towners. In most places, the Esopus is fairly narrow and shallow, and the fish are small but feisty. 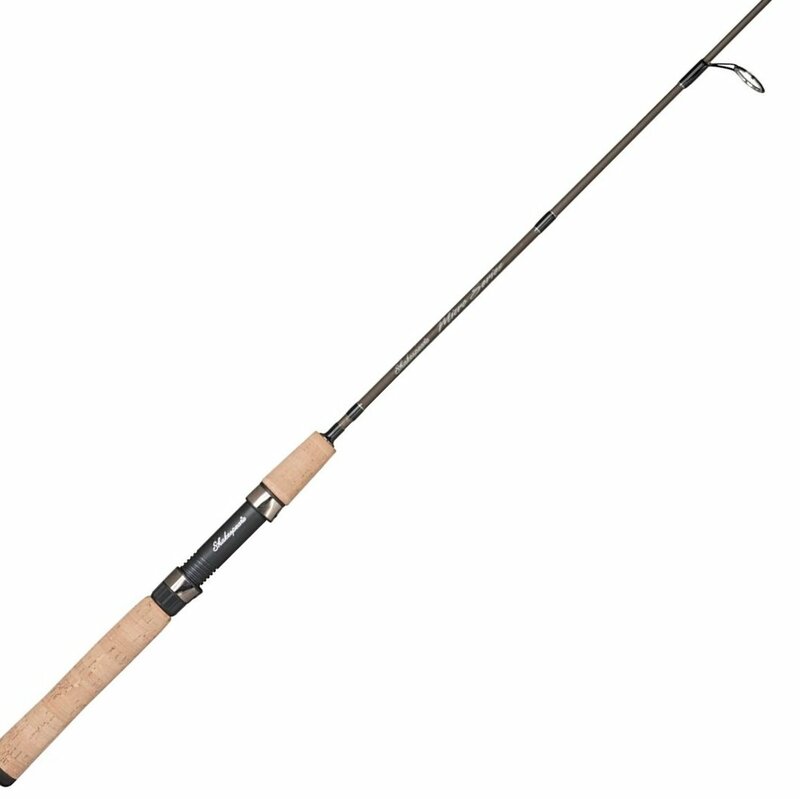 So "ultra lite" rod, real, and tackle make the most sense and are what I depended on. But first, you need a fishing license. Word to the wise, don't wait until the day you go fishing to get your license. Although the hardware store on Phoenicia's main street sells them, in my experience, and the experience of almost anyone else I've talked to, this is an unreliable means. If the employee who knows how to work the machine is away, you are stuck. A better way to go is to get your license at Shandaken's town hall located just off of Highway 28. The only problem is they're only open weekdays. An even better way is to get your license online. Beyond the fishing license, it also makes sense to register for a NYCDEP permit. The permit allows anglers to enter certain otherwise restricted NYCDEP land and, since the permit is free, there's no reason not to register in order to open up all fishing options. Again, an ultra lite setup makes the most sense since you will be casting tiny lures to the picky trout in these waters. I'm a beginner (and frugal!) so I wasn't looking to invest in premium gear. 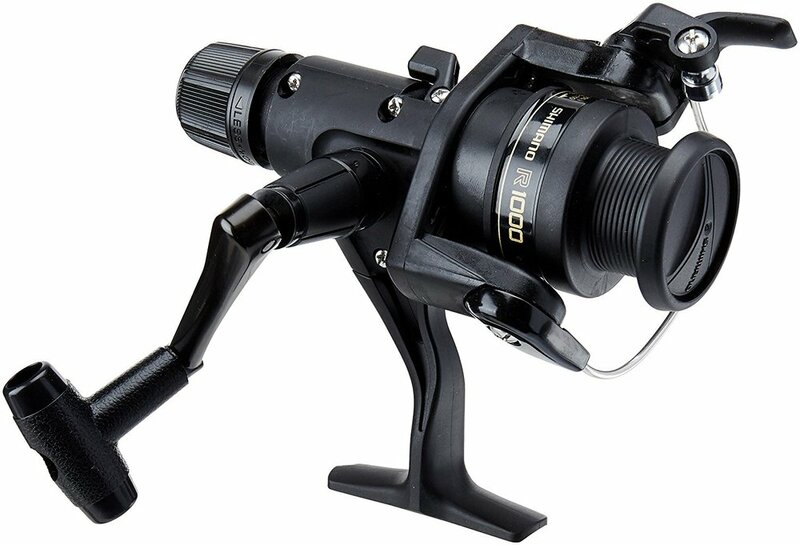 I've been using a Shakespeare five and a half foot Micro Series spinning rod ($23) and a Shimano IX1000R spinning reel ($15) which I particularly like because of the Quick Fire lever that allows for simpler one handed casting. This setup has served me well thus far. I personally have been using four pound test line with a two pound test leader. 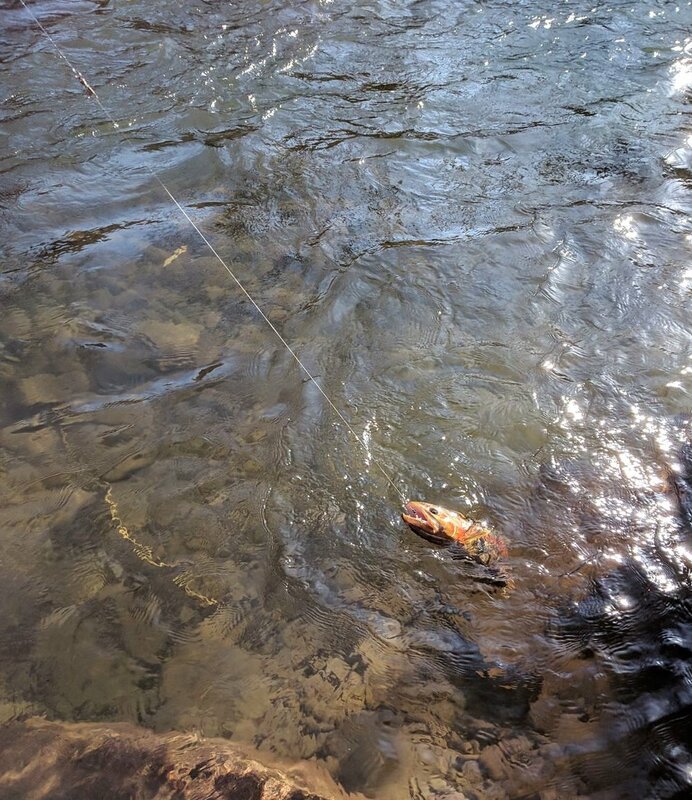 In my experience fishing the Esopus, the smaller the lure, the better. I've had particular luck with Mepps spinners and Acme Phoebe spoons but have also tried Rooster Tails, Powerbait, and Panther Martins, among others. With respect to colors, the more basic colors have worked best -- I've stuck largely to silver and gold, rather than much of the bright, fluorescent side of the spectrum often seen in tackle shops. Also, note that I haven't experimented with any live baits (worms, crickets, etc.). I'm sure those could work as well. Finally, if you are planning to release the fish you catch (which I do), barbless hooks are a must. I learned this the hard way, forgetting to snip the barbs on my lure prior to hooking my first trout. I felt terrible as the embedded barb made removing the hook much more difficult, and stressful for the fish, than necessary. To make any lure barbless, simply grip a pair of pliers and squeeze the barb until it flattens to the remainder of the hook. It makes hook removal much quicker and easier on the fish. At first, I didn't think a net was necessary. After having a large Rainbow snap my line as I fiddled with it in front of me trying to snap a picture, I realized my mistake. Plus, a net means you don't have to handle the fish with your hands as much making for less harmful hook removals and releases. I've been using an affordable rubber mesh model. Similarly, a set of fishing pliers is invaluable for cutting line, snipping barbed hooks, and removing deeply embedded hooks. Get these tools and you should be set. A public service announcement: The area surrounding the Esopus Creek is blanketed with ticks. I had my own run in with them and am much more careful now. It's almost impossible to reach many fishing holes without traversing through tick laden underbrush. Long sleeve, tucked in clothing makes sense as does frequent tick checks. Now you are ready to land the lunkers! Like this post? Want to read more about Travis and Nicole's travel, book, and wine adventures? Check out Hiking Mount Tremper in the Catskills near Phoenicia, New York.